Mark Waid's Daredevil unfortunately loses a bit of momentum between its first two trades, Daredevil Vol. 1: Devil at Bay and Daredevil Vol. 2: West-Case Scenario. The Shroud is no longer present and the Owl looms in the background as part of the trade's unusual opening. Called "Issue #1.50," the first story celebrates the fiftieth anniversary of Daredevil's first appearance with three tales that don't quite click. Brian Michael Bendis and Alex Maleev reunite for a noir-inspired short story about the lethal nature of dating Daredevil. While the art is gorgeous, it revolves around a love interest -- and a marriage! -- that we've never seen before. After this, Karl Kesel writes and draws a short about Mike Murdock, the fake identity Matt created in the 1970s to convince people that he wasn't Daredevil. It's fun but unfocused; the framing story peters out halfway and the ending lands with a thud. The first story in Issue #1.50 relates directly to Mark Waid's run. It's a look into a potential future where Matt is an ex-mayor of San Francisco with a son who inherited his powers at a much greater level. Along with the first mention of the Purple Children, this future introduces Jubula Pride, the Owl's daughter, who has a deep obsession with Daredevil. Waid has said that this future is not canon, but it's an interesting way to jump forward without vast consequences. It could also serve as a coda if he doesn't return to the pages of Daredevil after this current volume ends. With the three opening stories concluded, the core of West-Case Scenario is a pair of two all-time great stories, starting with the Original Sin tie-in. I'm not sure if Waid has ever confirmed this, but I think he has a hidden goal of having Daredevil interact with as many other Marvel characters as possible. Previous runs kept Matt mostly confined to Hell's Kitchen and classic enemies. Waid, on the other hand, has put him up against Doctor Doom, the Sons of the Serpent, and the Shroud, and has teamed him up with Captain America and the Legion of Monsters. This trend continues with a personal mystery about Matt's family past interwoven with the Black Panther and Wakanda. Matt found his long-lost mother in a convent back in the Frank Miller days, but the reason for Sister Maggie abandoning her family had never been revealed before now. The memory-inducing burst created by the Watcher's eye in Original Sin makes Matt think that his father beat his mother, sending him into a massive crisis. You might recall that in the second trade of the previous volume, he nearly beat Mole Man to death when he accidentally destroyed Battlin' Jack Murdock's grave. It's therefore a shock when Matt covers up "A Good Man" on his tombstone with mud while trying to process his grief. The Black Panther enters the picture when Maggie is arrested for accidentally trespassing on a secret Wakandan chemical weapons base in New York. Complicating matters is that the Panther in charge is Shuri, the sister of T'challa (who was busy in New Avengers), and she doesn't have the same alliance with Matt that her brother does. After freeing his mother, Daredevil discovers the true reason for her departure: she had post-partum depression. Jack was saving Matt in the vision; like many of the memories summoned in Original Sin, it was a misunderstanding. Depression becomes a linking theme between this story and the next due to the arrival of the emotion-controlling Purple Man. He's only a sub-villain, though; the main foes are his Purple Children, who have his abilities but can form a powerful hive mind when they are in proximity. The Purple Man is infamous for what he did to superheroines Jessica Jones and Songbird, and these children come from similar illicit affairs. In his head, his goal is honorable: he thinks that the children will love him automatically instead of being forced to via mind control. It's a huge miscalculation as the Children instead kill him (temporarily) and cause a ruckus in San Francisco. The Purple Children are a mix of The Village of the Damned and the Delightful Children From Down The Lane from Codename: Kids Next Door, and it's all played to maximum creepiness. They force adults to abide by their whims and are even able to make Daredevil so depressed that he can barely move. It's a demonstration of his willpower that Matt can push past this as well as Purple Man's heart-stopping command to "drop dead." David Tennant, a.k.a. the Tenth Doctor, has been cast as Purple Man on Netflix's A.K.A. Jessica Jones and I hope they use this arc as inspiration for his portrayal on the show. 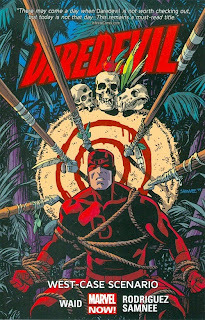 Art for Daredevil Vol. 2: West-Case Scenario comes primarily from Chris Samnee, but this time he's joined by Javier Rodriguez on the main story in #1.50 and the Original Sin arc. I really liked Rodriguez's depiction of Matt in the cemetery; I've never seen rain look so solid in a comic book before. He was also able to create excellent shadow effects and produce a building outline filled with sound effects to represent Daredevil listening to hundreds of conversations at once. Despite the choppy opening, the trade quickly rights itself with the main stories. There's a subplot beginning here that will play out to great effect in the next volume as Matt and Foggy set out to write Daredevil's memoirs. Next time, however, it's a return to Deadpool as he, Hawkeye, and another Hawkeye take on Black Cat for reasons that I'm still trying to figure out.